I am selling my condo that I have owned since new - I have been the only owner and single person living in the condo so it is in great shape and everything is always kept very clean and tidy. I am selling it by owner and it is a great spacious & bright condo at Edgewater in the Selkirk Waterfront - ground floor with easy access in and out. The Edgewater is a beautiful building and all owner occupied. Experience the lifestyle this exciting community has to offer with cafes, a pub, fitness club, Montessori school, the Galloping Goose Trail & the Gorge Waterway all within steps of your door! This feature specious 2 bedroom suite has it all! With almost 1,200 sq. ft, with partial water views, 2 full baths in suite laundry, storage room, underground parking, kayak and bike storage. The gourmet kitchen granite topped eating bar opens to a spacious dining /living room area featuring a cozy fireplace ( gas is included in the monthly strata fees). Great design with the 2 bedrooms separated for privacy. The large master bedroom with ensuite, quality soaker tub and separate walk-in shower provides the perfect retreat! All very high ceilings and a great condo. 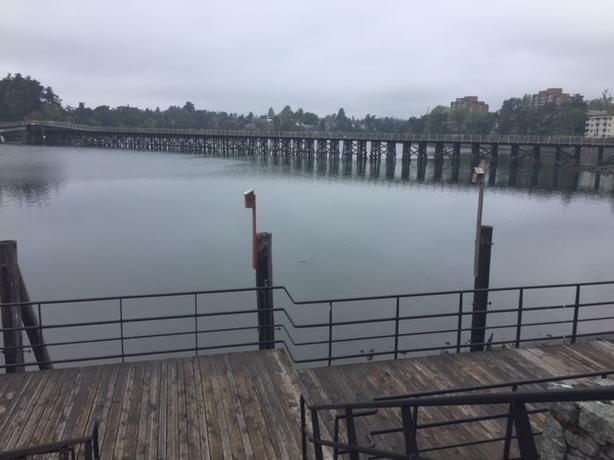 Overlooking Selkirk waterfront with water views with some of Victoria's best walking, jogging & kayaking, walking distance to restaurants, pubs, shopping mall & gym, on a bus route, pet friendly and BBQs with natural gas hook up off the patio. if you are looking for an amazing suite in a fabulous upscale lifestyle area, don't miss out!. Please feel free to call or text me for a viewing of this condo. Realtors welcome to call as well. Although I am not in a rush to sell I can have a quick close if someone needs or a long close as well depending on timelines.